Why is this film called Rise of the Planet of the Apes? Because 20th Century Fox, the producers (including co-writer, Rick Jaffa, and Peter Chernin), and director Rupert Wyatt are thinking sequels and franchise rights. They’ll probably get their wish: After all, the Apes model as established by Charlton Heston as the rudely enslaved master race goes back 40 years now, and movie monkey business regards the extraordinary King Kong (1933) as its founding father. But the filmmaking enterprise might attend a little more closely to the eagerness for compromise in its own narrative set-up. We are in northern California at the Gen-Sys Laboratories, where a struggle for direction exists between Will Rodman (James Franco), one of those handsome science geniuses the movies love, and the business head of the outfit, Steven Jacobs (David Oyelowo). What’s at issue is a magical new serum that might allow brain cells to regenerate, which would dismiss Alzheimer’s and offer all those other good things out of expensive health care short of the fundamental economic and social reforms we require. If the serum does work, Will can give a private dose to his dad (John Lithgow), once a fine pianist but now not much more than an ape who can play a few notes at random. When Howard Hawks directed his film of Monkey Business (1952), he knew it was a farce, but he trusted that that was the fastest and most entertaining way of delivering his point. More or less, that point was, be careful about the hopes you invest in science. Cary Grant was the genius at a laboratory intent on finding an elixir of youth. Why was that a hot topic? Well, because the laboratory boss, played by Charles Coburn (around 75 at the time) was anxious to get on a level playing field (or any soft, flat surface) with his secretary, Miss Laurel (played by Marilyn Monroe). And then, an amiable chimpanzee adds some serum to the laboratory drinking water. One gulp, and Grant and his wife (Ginger Rogers) are teenagers again. 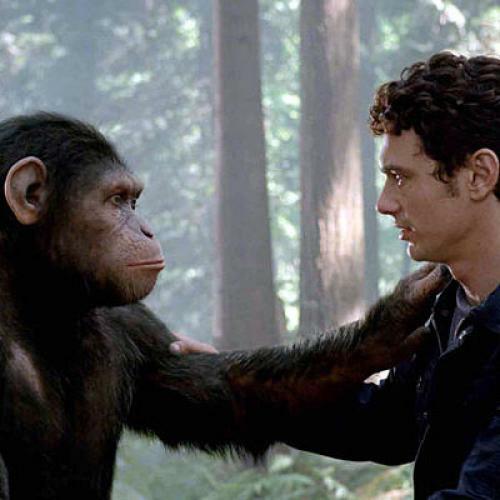 In contrast, Rise of the Planet of the Apes has its modest head over-crowded with too many undeveloped ideas. Plus, it has an ape hero, Caesar, who seems never to have got over seeing Kirk Douglas in Spartacus at an early age. So he aspires to lead a slave revolt—until he realizes that he could be sitting on a franchise gold mine. Never mind, Caesar is the reason to see this daft, breathless picture. You don’t have to believe this, but Caesar is a genius monkey saved and smuggled out of the Gen-Sys premises by our necessary idiot, Will. Thus, he is raised in a Marin County household where he behaves like a cuddly mixture of Shirley Temple, Olga Korbut, and Burt Lancaster—I throw Burt in not just in the spirit of trapeze, but because Caesar is clearly very male. The film casts a blind eye on what he might think about Caroline, Will’s live-in, who is played (no, “played” is too strong and hopeful a word) by the astonishingly beautiful yet vacant Freida Pinto (she was in Slumdog Millionaire). A time comes when Caesar gets too big and strong to be pet or pal, and too inclined to get into fights with all the unpleasant people in the picture. So he is put in what pretends to be a nice “home” for monkeys. But we know not to trust this because the place is run by Brian Cox, and, all too soon, it turns into a very frightening “madhouse.” That’s when the glint of power, leadership, revenge, and Spartacus lights up in Caesar’s eyes. The eyes are the point, for Caesar is played (though, again, that word isn’t quite right) by Andy Serkis, who has a case for being the most important screen actor of the modern era. Serkis is 45 or so, and he had done a lot of work in Britain, without really becoming known. Even now, you may know his name better than his face. For Serkis is the master of a thing called “performance-capture technology.” You may ask, isn’t that just a fancy name for “film acting”? It’s more: It’s the ability to record tiny human gestures or expressions and marry them with inhuman forms. Serkis had his breakthrough as the Gollum in the Lord of the Rings trilogy, and he did Kong in the Peter Jackson remake. He will be seen later this year as Captain Haddock in Steven Spielberg’s animated film of The Adventures of Tintin. And it is his eyes and ideas that are the life force in Caesar. Indeed, there are moments early on, as we come to appreciate the blend of technology and a high-acting intelligence, when the hope springs up that Rise of the Planet of the Apes might have been a great mainstream entertainment. (It might also send you back to the HBO movie, Longford, from 2006, where Serkis reveals his own ability and delivers unmitigated evil as the murderer Ian Brady.) Everything about Rise, though, is mitigated, not least the blunt nudge that the inevitable Spartacist defeat of the ape army was just a show. These apes will be back, for the movie ends with a slick diagram of their progress going around the world. Andy Serkis may become a great star, but I doubt he’ll be doing things like playing Ian Brady again.